Naan breads are rarely waistline friendly, with many racking up over 400 calories for just one. There can’t be many of us who can afford to splash out on that many calories without gaining weight. If you don’t want to give up your naan bread, you could always tear it in half and share it! 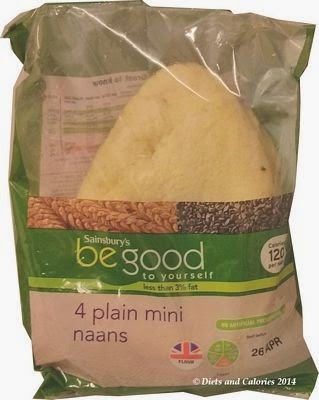 Alternatively, you could have a whole one for yourself by choosing a smaller, lower fat version such as Sainsbury’s Be Good to Yourself Plain Mini Naans. These have just 120 calories each. Each Mini Naan weighs 50g (around half the size of average naans) and scores a green traffic light for calories, fat, saturated fat and sugar. To cook, sprinkle the tops with a little water then place under a grill on moderate heat for 2 minutes. They can also be heated in the oven. I offered these to my family, omitting to tell them about their lower fat and calorie content. Everyone loved them and seemed more than happy with their 50g size. As long as you don’t overcook them, they are lovely and soft. They were perhaps a little drier than higher fat naans, but they’re still very tasty. Also if you’re dipping them into your curry, any perceived dryness is overcome by the moisture from the curry sauce. I’d buy these again, though it would be nice to find them in the coriander and garlic flavour too. 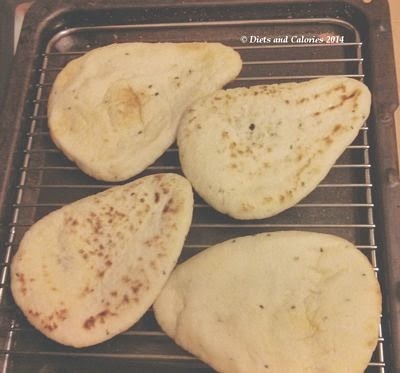 At the time of writing, a 200g pack of 4 mini naans cost £0.90 in Sainsbury’s stores. Nutrition information per 50g naan bread: 120 calories, 4.1g protein, 24g carbs, 0.7g sugars, 0.6g fat, 0.1g saturates, 1.5g fibre, 0.46g salt. Ingredients: Wheat Flour, Water, Low Fat Yogurt (from Cows' Milk), Rapeseed Oil, Spirit Vinegar, Raising Agents: Disodium Diphosphate, Sodium Hydrogen Carbonate, Calcium Phosphate; Yeast, Salt, Black Onion Seeds. Other Information: 3 Weight Watchers ProPoints per naan. Suitable for vegetarians. Contains milk and wheat gluten. Freezable.